As someone who spends their work life, and a lot of their personal life, online, particularly on social media, I've felt truly conflicted recently with the role of social media in my life, and whether my constant participation is necessary (/harmful/frivolous/beneficial) for my career and overall well-being. And I'm not the only one... from influencers to companies, people are (finally) starting to discuss the benefits of a social media detox. I've definitely seen a need for one come to fruition in my own life: Often I see on social media, particularly with creatives such as writers, designers, photographers, painters, that they create such beautiful things in so many ways, and not just for work. They pursue passion projects. They design 'just because'. I found myself questioning how they had ‘all of this time’ to do these things. And then I started to notice... while they were creating, and simply posting to social media, I, unlike them, was being sucked into the vortex of the endless scroll. Maybe an assumption here, but probably not. Here's where I feel an internal conflict. As a digital marketer, is my up to date knowledge on everything social media something that makes me successful in my career? In some ways, I do think it is. Knowing who's who online and forging connections both professionally and otherwise is a large and super important part of what I do. I even advise my own clients on the importance of timely engagement with their followers and other accounts. So what will a social media detox look like for me? What's the perfect equilibrium between staying on top of a social platform that can be compared to a black hole (...yikes) and taking the time to step away, to enjoy the life that I'm living in real time. A nighttime cutoff | I’m trying to step away from social media, and my phone in general, after 9pm. I just have to remember...anything that is posted at 9pm will be most definitely be there waiting for me at 7am. Plus, less screen time before bed is proven to have a huge positive effect sleep, and for someone who truly values sleep, this is a no brainer. Do something 'active' | I prefer to walk to most places that I need to go in the city, so I am walking a lot of the time. What's nice about this time is that for the most part, I put in my headphones and use that time to zone out with music and my own thoughts. But active is subjective: If it's not walking, I like to cook to keep me busy. Whatever it is, do something that takes you off the seat that you're in and gets you moving. It helps. Short bursts of unplugged time for creativity | Set your alarm for 20-30 minutes and put it on silent, face down. Use this time to be creative. Usually once I get inspired and over those first few minutes of 'withdrawal', I actually get so involved that I don't want my timer to end! Recently I've been trying stream of consciousness writing. I've wanted to get back into writing for fun, and plus, it's said that stream of consciousness writing (essentially journalling) is really great for mental wellness and stress relief. Disassociate posting for yourself vs. posting to post | The pressure can be real on this one. If you're not posting, are you losing followers? Will people forget about you? Will the algorithm work against you? When at first we might say yes, the reality is that engaged followers only care about your content and how great it is... which normally is a natural result of passionate work. When taking and posting photos becomes laborous, or you post something just to get content out there, it usually isn't your best. I’ve been working to except ebbs and flows in my creative process, as opposed to fight it, and work with my inspiration only when it comes naturally. Just look up | Whenever you consciously find yourself scrolling on your phone, then also make the conscious decision to just look up, look around and put the phone down. Take a few deep breaths, pet your dog, stretch. It truly becomes the first step in breaking the habit. Have you tried a social media detox?? I’d love to know! I don't have to explain how hard it is to summarize a city as amazing as Paris. There are no favorites! But, without picking particular places or memories over others, I wanted to share some general but notable thing to do and see for those of you who may visit for your first time! What were your favorites when you visited? Or the most memorable parts of any of your travels?? 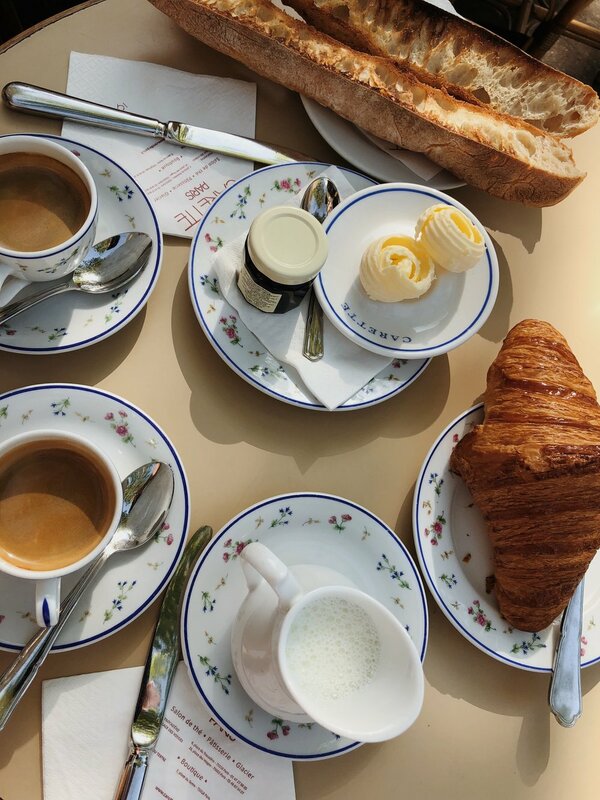 A true French breakfast | What eggs, toast and bacon is to the American, a toasted baguette with butter and jam and an espresso is to the French. Um, yessss. I love that the French, as do most Europeans, don't rush a sit down meal. You're either eating on the go, or sitting for at least an hour, even for breakfast. It was the best way to start the day. 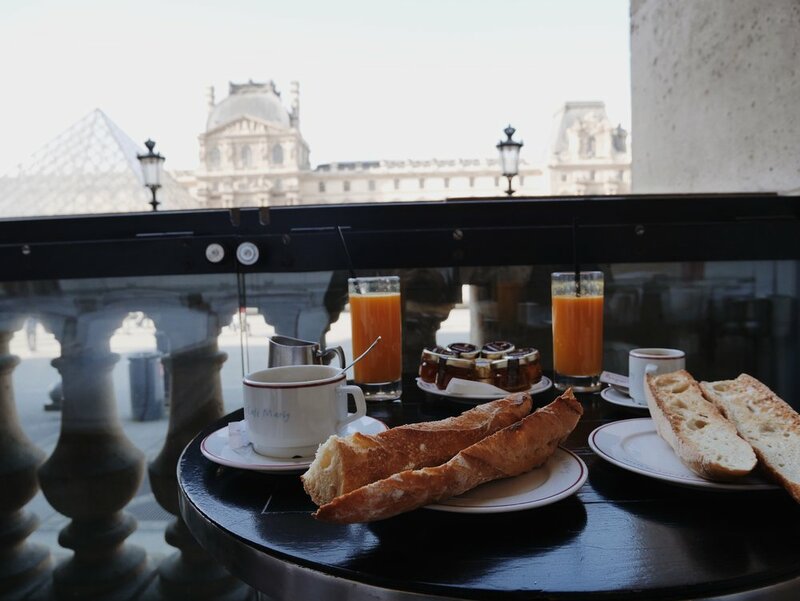 My favorite was Carette in Trocadéro for the amazing coffee and breads and Café Marly for the one-of-a-kind location in the courtyard of the Louvre. Chez Julien | A dinner highlight... and in Paris, that's saying a lot. Great cocktails, dinner and dessert, but also a particularly great location and atmosphere. I loved that it was fairly upscale, while also being approachable and fun. 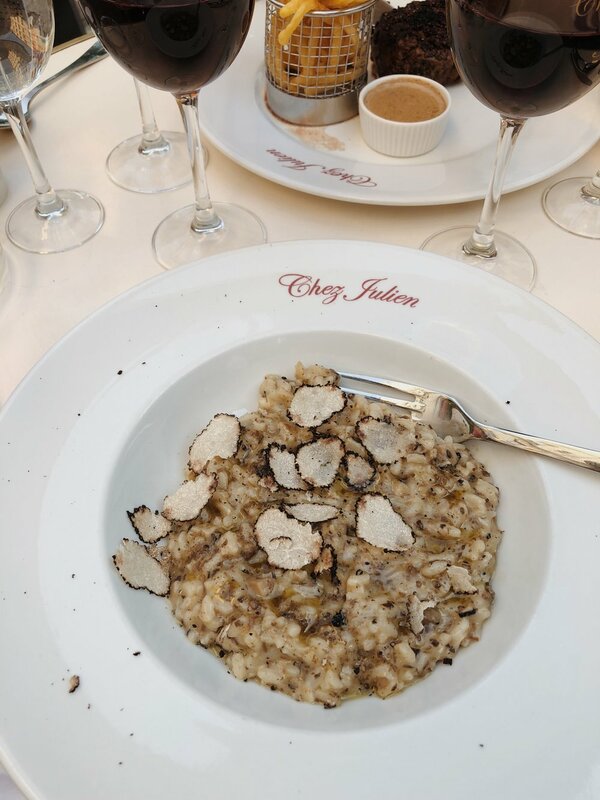 Not to mention, if you order the truffle risotto, they shave fresh truffle on the top... a (very expensive) rarity in the States. 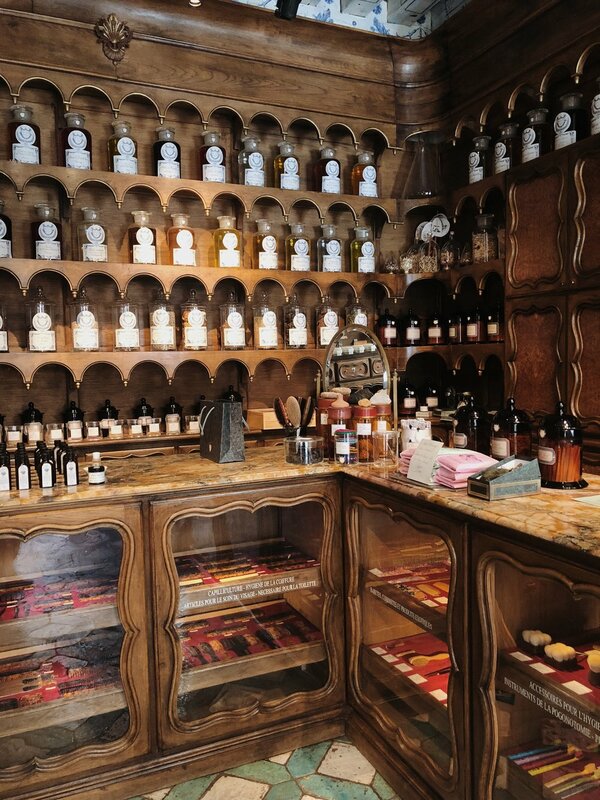 Buly | I initially heard about this shop from The Good Trade's Sustainable City Guide to Paris, never expecting to stumble upon it. But when we did, I was so happy to have visited. 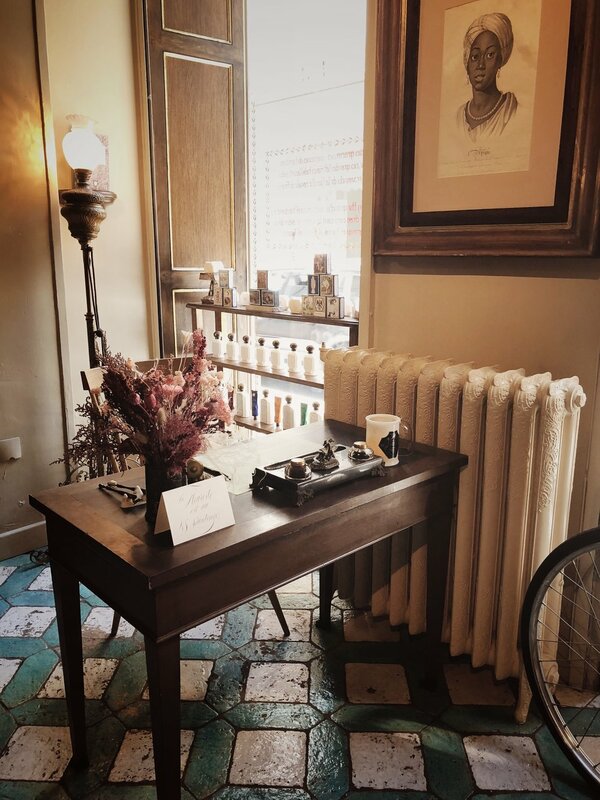 Founded in 1803, this beauty and grooming shop is traditional in it's products and service. I highly recommend stopping in to pick up a special gift for someone back home or yourself! Not only are the products high quality and all natural, but the time and service put into your purchase will make it feel like a million dollar steal. 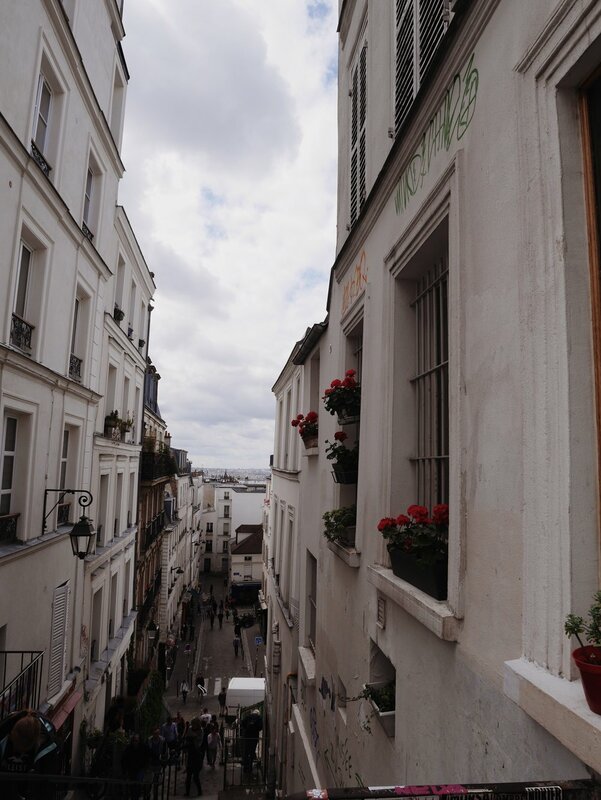 A visit to Montmartre | Just north of Paris is the large hill located in the city's 18th arrondissement. 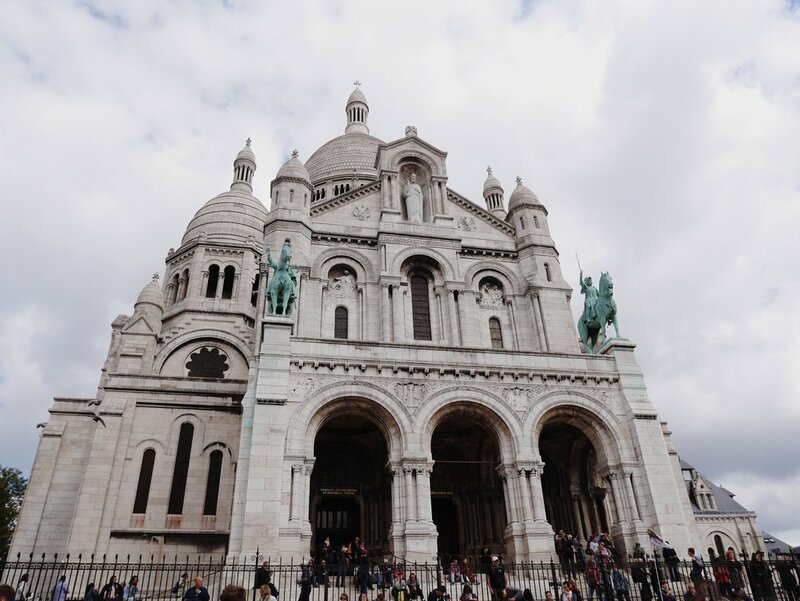 This little part of town is home to a wonderful 'aerial' view of Paris, Sacré-Cœur, an iconic church, genuine artists and quaint places to eat and drink. It was a nice change of pace from the bustling city, and so charming! 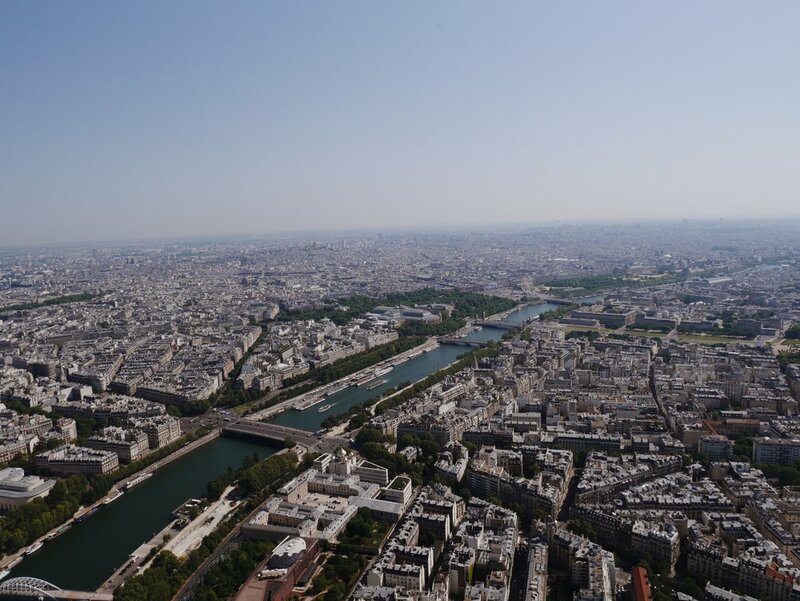 Experiencing the Eiffel Tower more than once | It may sound obvious, but believe me when I say that you are going to want to experience the Eiffel Tower more than once, at all times of day... Not only did we take the ride to the Sommet (Not recommended for those afraid of heights, the elevator ride to the top even made me uneasy! 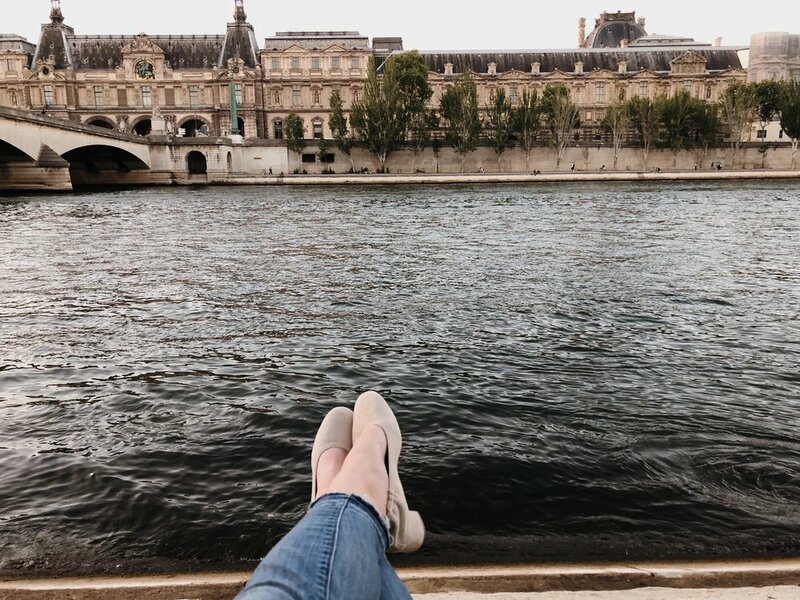 ), but we sat in the park with wine to watch it sparkle at night, took photos in the morning, and also did as the Parisians did and had a picnic on the Siene at sun down. Stop by the boulangerie, fromagerie, and grocery for all of the things you need to sit on the edge of the water and live like a local. Now that it's almost May, is it ok to be in full-fledged spring and summer mode?! I say it is. I'm not sure if I'm being influenced by 2018 trends and style, but for the first time a long time, I'm really gravitating towards warm tones; browns, mustard, orange and pinks. Anyone else? Whereas the year started out slow, we're sure in the swing of things now! May is starting with a week-long trip out of the country, and all of my weekends in June are already booked. 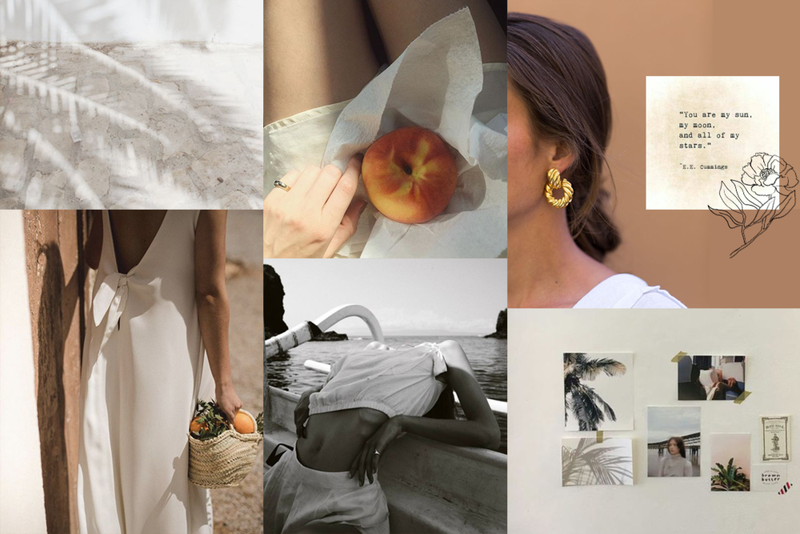 I'm embracing the ebb and flow of it, particularly in anything linen and white. Be sure to follow me on Pinterest to see my entire summer 2018 moodboard, and everything else I'm loving right now. It's freeing (of course) and terrifying and exciting and stressful, all at once. So why am I doing it and how did I get here? Second: 'if you don't like something, change it'. So I started to do any and everything to get experience and learn more in a field that truly interested me. The gritty truth behind the facade of social media is the I don't remember the last time that I wasn't working around my full-time job! I went back to school for fashion marketing, I was a visual merchandising associate (some of you know that those shifts often start at 4 or 5AM! ), I starting blogging, I networked as an 'influencer' to collaborate with brands (air quotes due to the fact that I don't really consider myself one), I took on clients part-time and honestly, I don't know what I would do with all of my spare time if I wasn't doing those things at one point or another... (Maybe workout a little more, haha, but that's besides the point...) Making a career change in any capacity requires hard work, outside of the daily grind! Anyway, an opportunity presented itself recently to jump into this work full-time and I simply took advantage. Take it from me, and self-employed success stories like Jess Kirby, I don't exactly recommend this. Security and having a strong plan b, c and d are usually very important to me, but sometimes that methodology does not foster your growth and full potential. As mentioned in Jess' post, "leap and the net will appear", and I've had to believe in that whole-heartedly. At the same time that things were lining up in my professional life, I felt as though I was truly discovering my values and how I wanted to live my life as an adult... my late twenty's came in HOT. Eesh. I've embraced minimalist mantras and zero-waste initiatives, which has lead me to the conclusion that I was not happy participating in the rat race that is 'socially accepted success'. Work, work, work to make money to buy things that put you in debt, take up space or just go to waste. If this sounds just way too out there for ya, check out this documentary. It may not change your life, but it will definitely give you perspective! To very briefly explain the logistics of my transition, I just started to pick up part-time clients as a way to ease from salaried employee to freelancer. I will say that it is impossible to take on a full client list and put enough time into prospecting with a full-time job, so if you're considering working freelance, you have to embrace the unknown that comes with leaving your current position to focus on self-employment, hopefully with a little financial security in tow. It's been about two months since I've been working freelance full-time. Is it stressful? Yes. Am I often doubting myself? Of course. Am I unsure if I will always have a steady stream of clients to pay the bills? What will happen if I don't? I think about these things all the time. But do you know what else? I get to go outside and enjoy the fresh air any time of day that works for me. I create my schedule based on what I want, and have to, get done, which allows me to work where and whenever. I have the flexibility to travel more than I ever have. I am not forced to commute to a desk for a certain time to display that I am hardworking. (And maybe best of all,) I get to be my dog's midday dog walker. In short-- I may be working harder than I ever have been, but I've also been able to enjoy everyday life more than ever too. And to me, that's what it's all about. I am a huge advocate for the traditional paper and pen. I saw someone post once comparing a creative's mind to a window with thousands of tabs open at once... and I could not relate more. I'm one of those people that if I don't write absolutely everything down, it will either consume all of my thoughts, hindering my ability to concentrate, or it's gone completely. IE -- I write everything down from remembering to fold laundry to the food I plan to cook for the week. Flexibility | I don't know about you, but for me, some weeks are jam-packed, while others are very slow. In other pre-designed journals, I had too much room on some days and not enough on others. With a bullet journal being completely at my disposal, I can design each week based on what I have going on and what my needs are on any given week. Efficiency | The general benefit of the bullet journal is the extreme efficiency that it provides. Outside of just the format, the idea is that the user spends a few minutes at the beginning of each day reviewing what needs to get done and writing it down, migrating tasks that have yet to be accomplished from previous days. Watch this video from the bullet journal's creator to hear it explained in full. Reflection | After the year, your bullet journal becomes just that: a journal of your highs and lows, successes and failures. What tasks kept getting pushed off? Which goals did and didn't get accomplished? 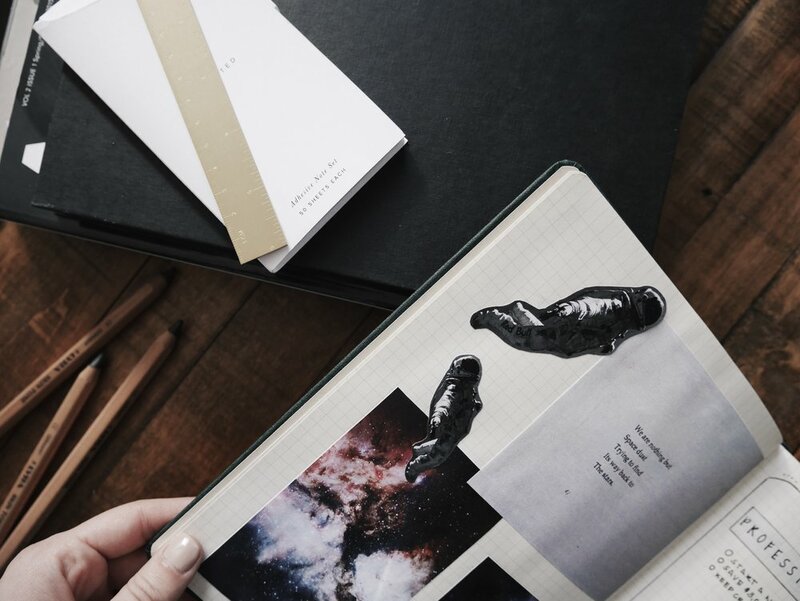 This journaling method essentially creates a blueprint into your innerworkings. Pretty cool, huh? 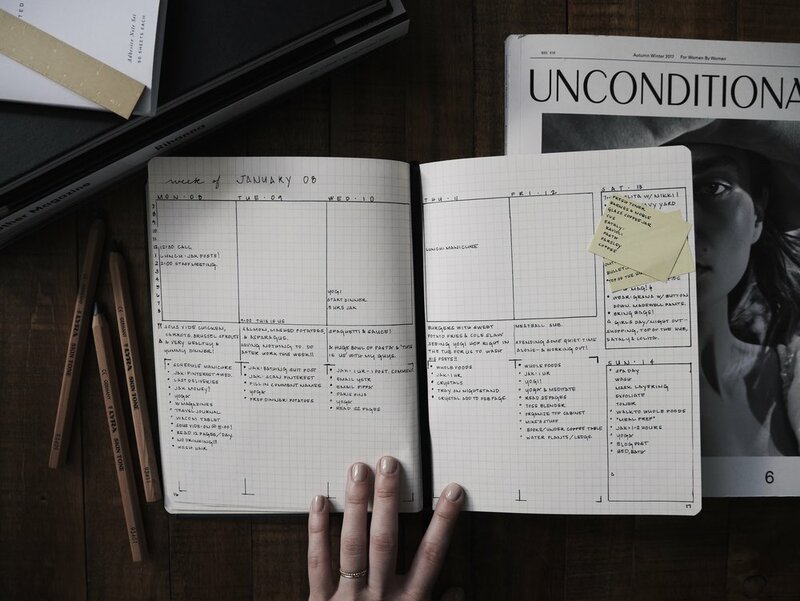 Achievement | The bullet journal allows me to crush all of the things that I set out to accomplish by taking large, overarching goals and breaking them down to manageable steps. How? 1. At the beginning of the year, write down all of your yearly goals. 2. As each month approaches, look to your yearly list, and write down a few very specific items that can be accomplished in a month to get you closer to your yearly goal. 3. Finally, write down on your to-do list the daily action that accomplishes your monthly goals! It becomes a tiered system. The best way to exemplify this method is with my yearly goal of reading ten books in 2018. To accomplish this overarching goal, I knew that I had to finish the book that I was reading on January 1, by the 31st; it became a January goal. How did I ensure that I completed the book? Simple math and I knew that I had to read 12 pages a day to stay on track. I wrote 'read 12 pages' on my to-do list every day. It may sound slightly obsessive (or at least for my reading example it is), but it is also truly effective! Do you bullet journal or do you want to try? What methods work for you and what do you like or dislike about it? The journaling nerd in me would love to hear about it! One of my New Year's resolutions is to infuse just a little more color into my wardrobe. As someone who is constantly trying to pair down my closet, you can imagine how I'm still a little hesitant. But, thanks to my love of this duster, I've begun to incorporate brown/rust and beiges into my closet. I can still wear these shades as a neutral, and that's the end-game for me! I styled these sateen pants with a white and denim look to stay grounded in what makes me feel comfortable (um..basics and the gray scale). And, guys, if you haven't heard of Grana, here I am to introduce you. Ethical and sustainable but also completely price transparent, this brand offers awesome quality pieces for a steal. This one is their Mongolian cashmere crew neck. I'm super excited to share that as of recently, I am the Boston-based ambassador for The Glossary! The Glossary is a collective of creative, talented women and a platform to connect, share stories and build community-- and one of my favorite sites. I'm super excited to share the 'strength in community' message and play a small role in the connection of female creatives from every walk of life through The Glossary. Read my interview with them here! And as a cardigan over a jumpsuit. Plus, it's safe to say I can wear this piece 100 more ways. (So worth the $$!) 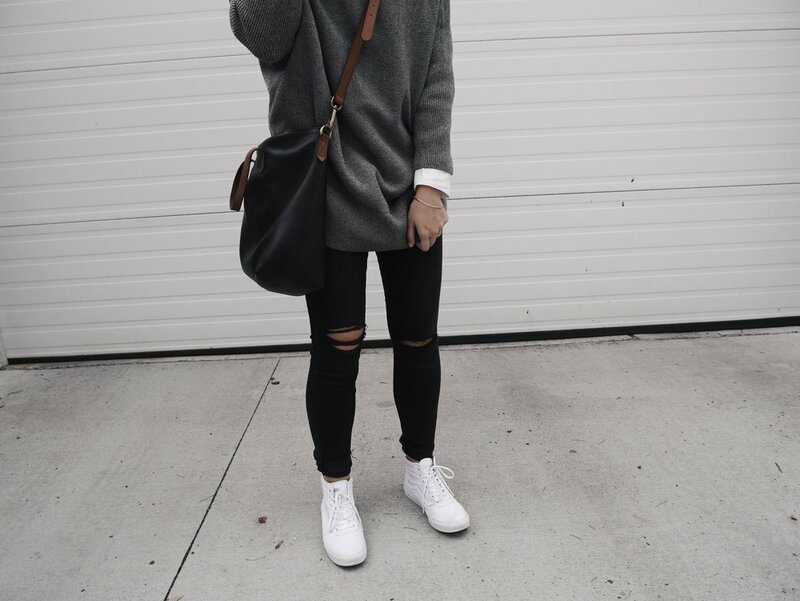 What item in your closet can you style with almost any outfit?